Lush Fab Glam Inspired Lifestyle For The Modern Woman: A Valentine's Day Gift like No Other. A Valentine's Day Gift like No Other. It's almost Valentine's Day and the town is painted with beautiful pink and red hearts as we all get ready to celebrate love. Valentine's Day has quickly evolved from a reserved for spouses and sweethearts into one where we show the people who mean the most to us just how much they are loved. Sometimes a box of chocolate, or a bouquet of flowers that wither away within a week just doesn't cut it. 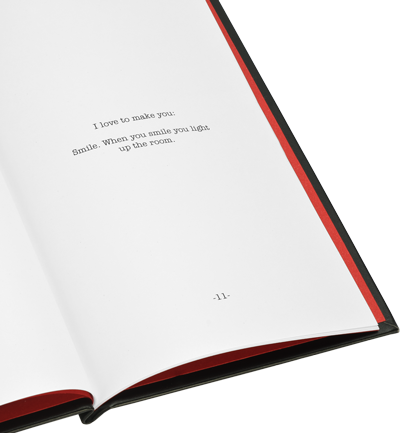 The perfect Valentine's Day gift will come from the heart, expresses our love and immortalize our words and emotions in a way a perfumes, Valentine's Day cards or other temporary gifts can't, like a Heartfelt Book. I loved the experience and the concept of creating a beautiful book online that allowed me to choose a few simple questions and easily write down my answers. With the ability to customize the theme, look and feel of my book including the dedication all from the comfort of my laptop in less than one hour. Plus you have the option to start working on your book, save it and come back to it later or another day to make additions or changes. My finished book looked amazing on-screen but I was not prepared for the quality, style and the overwhelmingly emotional response from my spouse. Sometimes simply saying "I Love You" can become cliché but creating a book that reminds your love of your most beautiful moments together. Having him or her read on paper why they mean so much to you and expressing just how incredible you think they are in a Heartfelt Book is something that will melt even the toughest heart. Create your own unforgettable Valentine's day gift at HeartfeltBooks.com and give your special one a gift like no other this year! P.S you can order your heartfelt book until February 10th internationally and until February 13th in the U.S and have it arrive in time for Valentine's Day! This post brought to you by Heartfeltbooks.com all opinions are 100%. Share with us by leaving a comment below. Love this post? Don't miss our fab tips, giveaways and more! Subscribe Here for your V.I.P access. What a great gift idea! I did this last year. My husband thought it was the greatest thing in the world. He has read it over a million times and keeps it by his bed. I did this for my Mom's 75th Birthday. She loved it and I enjoyed doing it. It's a win win gift! What a great gift idea! I love gifts that are heart-felt and personalized. Thanks so much for sharing this! This is a fantastic gift idea and one that anyone would enjoy receiving. Thanks for sharing. I'm headed over to the website now. When hubby and I left Parrot Cay, one of our co-workers made us a book like this with people's memories and photos of us. It was lovely and touching! Stopping by from SITS comment love.